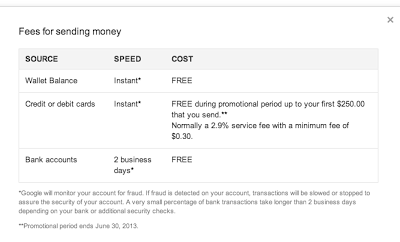 Google Wallet became one more way to manufacture free spending on your credit card. During its promotional period you could send money for free to a friend for free and pay for it with a credit card. The promotional period is over so it isn't completely free, but that's not the entire story. Your first $250 is still free! Anything $250 or above normally costs 2.9% or a minimum of $0.30. It was nice while it lasted. It's still free to send money via your bank account.